Revenue dipped by 1% amounting to $674.74 million, down from $680.34 million reported a year ago. The Company had an 5% decrease in Cost of Sales to $366.10 million and consequently, Gross Profit increased by 4% or $296.71 million year-to-date to $308.65 million. For the quarter, Gross Profit increased by 4% to $164.69 million. The Company had Other Losses totaling $5.35 million relative to the loss of $93,163 for the same period the prior financial year. Finance income declined 61% from $971,471 to $383,545. Once considered, Profit before Expenses increased by 2% to $303.69 million. Administrative Expenses has decreased by 5% to $126.30 million (2017: $133.24 million) while Selling, Distribution & Promotion Expenses increased by 41% to $103.30 million (2017: $73.46 million). As a result, Total Expenses increased by 11% or $22.90 million to $229.60 million. For the quarter, Total Expenses increased by 5% to $118.34 million. The increased expenses resulted in Profit from Operations declining by 18% from $90.88 million for the period under review to $74.09 million year-to-date. Finance Costs increase by 16% to $2.71 million and once considered, Profit before Taxation has declined by 19% or $17.17 million to $71.38 million. Taxation has decreased by $2.10 million or 19% to $8.98 million. 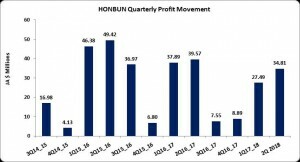 Once considered, Net Profit after Taxation amounted to $62.39 million, a 19% decline relative to the $77.46 million reported in the similar period for the prior financial year. For the quarter, Net Profit after Taxation has declined by 12% to $34.8 million. Consequently, earnings per share (EPS) amounted to $0.13 (2017: $0.16) year to date, while EPS for the quarter closed at $0.07. The twelve months trailing EPS amounted to $0.167. The number of shares used in this calculation was 471,266,950 shares. As at May 17, 2018, the stock was trading at $4.70. Total Assets increased by $51.14 million or 7% to close at $762.95 million as at March 31, 2018 (2017: $711.81 million). The increase in total assets was largely due to a 24.49% increase in Property Plant and Equipment that closed the period at $437.35 million. Shareholder’s equity totaled $599.04 million compared to the $539.31 million quoted as at March 31, 2017. This resulted in a book value of $1.27 relative to $1.14 the prior year.